The Oxford Times (UK) has declared that the VocalEssence Ensemble Singers “have a blend that could—and should—be the envy of every choir in the business.” Founded in 1991, the Ensemble Singers are acclaimed for their “superbly blended sound” (Birmingham Post, UK) and “exemplary technique” (Minneapolis Star Tribune). 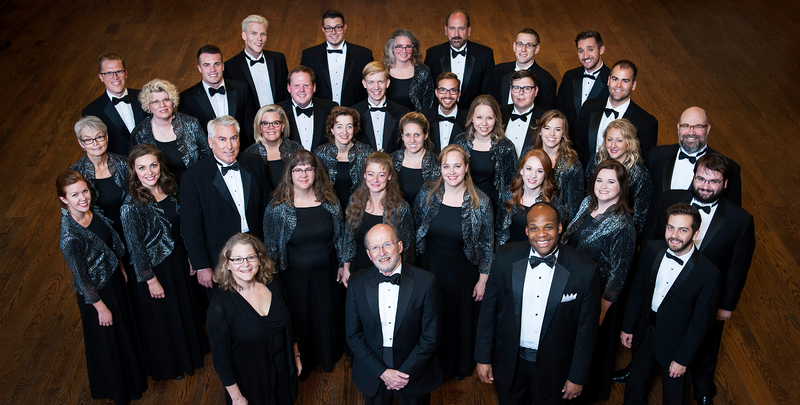 Lauded by the Times of London as “polished, bright and brilliantly balanced,” this 32-voice professional chorus is directed by VocalEssence Artistic Director and Founder Philip Brunelle and Associate Conductor G. Phillip Shoultz, III. Striving always to create perfection in their choral sound, the Ensemble Singers engage the audience with their vivid personality and expressive singing. They are equally at ease with works dating from the Baroque era to the modern day, approaching each musical endeavor with originality and freshness. Dominick Argento, Sir Richard Rodney Bennett, Aaron Jay Kernis, Libby Larsen, Stephen Paulus and Alvin Singleton are among the many composers who have written world premieres expressly for their voices. The Ensemble Singers completed an Asia Pacific Tour in 2014 that included performances in Seoul, South Korea, and in Beijing and Nanjing, China. Having completed a tour across Minnesota in 2011, the group recorded a CD in honor of Minnesota’s choral heritage, From the Land of Sky Blue Waters. Two other recent albums on the Clarion label feature the voices of the Ensemble Singers. The World Beloved: A Bluegrass Mass is the world premiere recording of a work by Carol Barnett commissioned especially for the group to sing with bluegrass ensemble. The Songs We Sang — Favorite American Folksongs is a collection of charming choral arrangements with guitar, harmonica, accordion, bass and piano. Auditions are held by appointment only. To schedule an audition, call 612-547-1451 or email info@vocalessence.org. For more information on VocalEssence auditions, click here. Interested in hiring the VocalEssence Ensemble Singers for an upcoming event? Learn more here.